The Appalachians are filled with world-class outdoor adventures. Within striking distance of many of the major cities in the Southeast are ski hills, mountain bike trails, gorgeous road biking opportunities, and perfect hiking and running getaways. One of the assets that truly stands out from the rest, however, is our rivers. We have more whitewater rivers than any other area in the country. So it’s not surprising that the largest paddling community in the world has developed in this area. Whether you’re looking for scenic flatwater paddles or steep creek descents, the Southern Appalachians are the place to be. 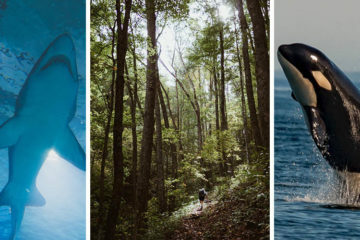 Here are a few of our top river picks for a variety of adventure recipes. There are a few rivers in the world that have played very large roles in the development of freestyle kayaking, and the New River Dries is certainly one of them. This section has catalyzed the wave-oriented era of kayaking and kayak design. At flows of 50-60,000 cfs, it is a massive, powerful river, capable of producing some of the largest river waves ever surfed. The highway bridge that crosses above the best of the waves creates an amphitheater setting, and the photos and video of these features have graced industry magazines and video. Years ago, the previously classic Laurel Creek was flooded and turned into an unnavigable rubble pile by a huge storm. That same rubble flushed into the New riverbed and constricted the flow to create these perfect waves. As one classic died, another sprang to life. Once paddlers are too tired to surf the chaotic waves and dodge floating trees, the rest of the run offers up classic continuous big water that will have any whitewater snob nervous on the lead-in, and grinning on the way out. Fortunately, for less experienced paddlers, the Dries can be paddled with a tiered approach, and has great play from 18,000 cfs on the Thurmond gauge all the way up to 60,000 cfs and above. Fayetteville is a rapidly growing hub for climbers, kayakers, mountain bikers, and other adventure sports athletes. One popular paddler’s eatery is Gumbo’s, which features a relaxed atmosphere fostered by the extremely friendly owner. It is the only Cajun restaurant in West Virginia, and the food is as delicious as it is unique. How could any “best of” list be complete without the Gauley River? Between its upper and lower sections, this big water West Virginia classic has absolutely everything from world-class playboating to huge lines in heart pounding rapids. Don’t miss out on this one during the very popular fall releases. Made famous by Burt Reynolds in the 1972 film Deliverance, the Chattooga remains a protected river corridor with miles of beautiful, untouched whitewater and wilderness. Because of its sustained high quality rapids and ease of access from the major metropolises of Greenville and Atlanta, it is our top pick for multiday river trips. The Chattooga’s headwaters flank Whiteside cliffs in North Carolina, and fall from the mountains to form the border of South Carolina and Georgia before terminating in Lake Tugaloo. The legally boatable stretch of the Chattooga, from Warwoman bridge down, is comprised of four distinct sections, which follow a convenient curve of difficulty from class I, II, III, and IV+. 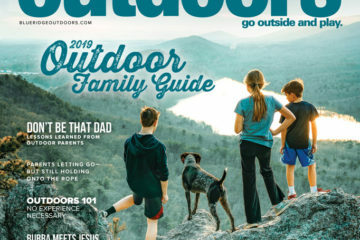 Each of these sections can be tackled in a day individually, but the Chattooga is an excellent river to pack the boats full of a couple days worth of supplies, and enjoy time around the campfire. Camping is allowed anywhere in the Chattooga River corridor as long as campsites are 50 feet from any stream or trail, and ¼ mile from any road. Top sites include Sandy Ford, Woodall Shoals, and a host of others… we’ve got to leave some for you to discover for yourself! Along the way, check out the views that surround this gorgeous river. For lunch stops and swimming, there are dozens of sandy beaches down its entire length, as well as Bull Sluice, which is an accessible class IV rapid just upstream of the Highway 76 bridge that provides the local sunbathing and swimming hangout. Seven Foot Falls at low water is a fascinating maze of dry and submerged potholes that can be explored, and it’s always worth a stop at Long Creek Falls on river left halfway down Section IV. Finally, check out the jump rocks below Shoulderbone Rapid, as well as the rock across the lake from the takeout on Lake Tugaloo. With Bull Sluice as a focal point of the river, one convenient destination is the Chattooga Whitewater Outfitters and Humble Pie campus. These are under the same management, and provide a good stop for gear, information about paddling, hiking, camping and fishing options for the area, as well as pizza and beer to tell stories over. The New River as it flows north through Virginia is another classic multiday trip destination. There are myriad options available, and these sections are convenient for the Blacksburg and Virginia Tech crowds, with a backyard playspot at McCoy’s. This river has a heritage as old as paddlesports themselves. The first waterfall ever run in a kayak was dropped by the McEwan brothers in the Great Falls section of the river, and since then it has been a focal point and enabler for the large Washington D.C. paddling scene. The same thing is now occurring in stand up paddleboarding, or SUP. Mather Gorge and the section below it are excellent paddleboarding destinations. These waterways are literally in the backyard of the city, but they still exude a wild and remote feeling. Multiple access points and rapid difficulties ranging from class I-IV mean that there is something there for every level of paddleboarder, and the moving water aspect of it means an endless learning curve is available. For advanced SUPers, check out the park and play waves at O-Deck or Rocky Island, and for a more mellow experience, it’s possible to put in below the biggest rapids of the gorge at Angler’s Inn. The Great Falls section is always an incredible sight to behold. For Great Falls and Mather Gorge visitors, Vie de France is a perfect nearby food fix. The smoked turkey cob sandwich is a must try, and your dining experience will be rounded out by the nonstop procession of Lamborghinis and Ferraris driven by wealthy D.C. moguls. The Nantahala is a perfect river for paddleboarding. It is possible to demo boards and paddles in a class I controlled environment right outside of the NOC. Once comfortable, the accessible and scenic class II waters of the seven mile Nantahala Gorge are a perfect downriver run, culminating in class III Nantahala Falls for an added challenge. It’s like California… but bigger. Those words from Green Race champ Tommy Hilleke sound melodramatic, but they are a perfect description of what the Toxaway experience is like for class V paddlers who dare to venture into her gorges. Like the granite lunar landscapes of the California Sierra Nevada, the Toxaway also has miles upon miles of smooth bedrock that host the largest and most photogenic cascades on the eastern side of the continent. Rapids with names like Space Mountain, Energizer, Feeding Trough, 40-40, Landbridge, and Wintergreen must be navigated to safely take out and hike 3.5 miles uphill to your vehicle at Frozen Creek Road. Paddling the Toxaway truly is like operating on another plane of reality. The first descent occurred in 1978, and took Keith Backlund and crew three days to complete. The river remained the stuff of legends until 2002 and 2003, when modern equipment and paddler skill level sparked its popularity as a day run for the best of the best. It is still one of the most challenging rivers in the country with brutal portages and an unrelenting riverbed that tops out at a gradient of 632 feet per mile. If you have the skills needed, get in touch with locals who know the way, and be sure to notify Gorges State Park of your descent, especially if hiking out after dark is a possibility. The nearby town of Brevard is an excellent recap destination after an intense day of altitude loss. If you want to spoil yourself a bit, check out Square Root, an excellent restaurant located down a quiet downtown alley. This Virginia gem is by far the state’s most intense steep creek. 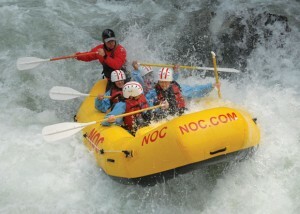 It is four miles long, and will test any extreme kayaker’s abilities on its many rapids, waterfalls, and slides. 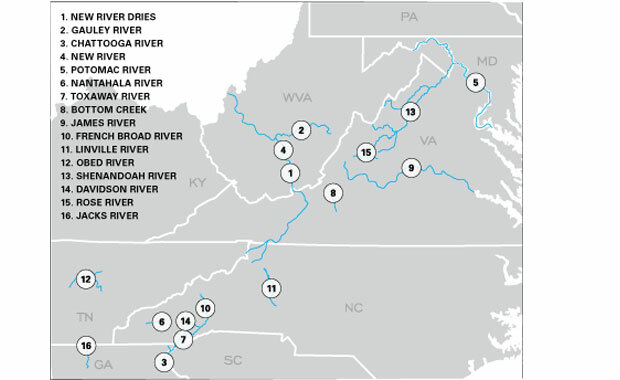 The James is Virginia’s largest river, and by the time it empties into the Chesapeake Bay, it drains 25 percent of the state’s water. Due to its sustained moving water for 12 successive boating sections, and the fact that its currents run the gamut from untouched wilderness paddling to urban after-work fixes, it proudly earns top honors for our Canoe Expedition category. The James originates in the mountainous western part of the state, and initially offers up many miles of pristine, untouched class I floating with excellent scenery and smallmouth bass fishing throughout. One particularly beautiful section runs from Route 43 at Eagle Rock to Route 630 at Springwood. This section is mostly flatwater with small class I ledges, but paddlers are treated to complete privacy, and endless national forest land to camp on. Another option is to paddle to Alpine and camp overnight, make the trip to Natural Bridge on day two, and then finishing out the third day with the popular Balcony Falls section. Balcony Falls is the most popular beginner/intermediate section of the James, with mostly class II and one class III in Balcony Falls. This section features surf waves and countless jump rocks, and is very accessible from I-81 and the Roanoke area. Another very popular section of the James is the class II-IV stretch that runs directly through downtown Richmond. Options abound on this stretch of river, and it offers a perfect way to clear out the cobwebs after a day in the office. 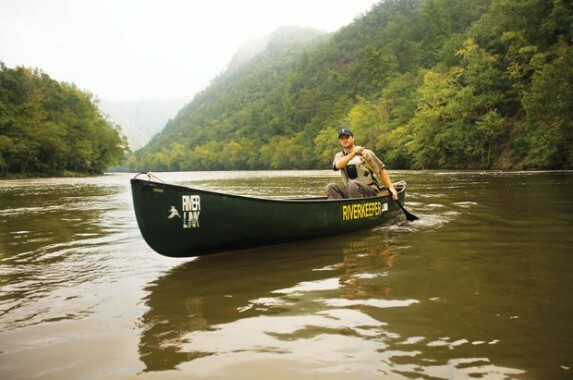 One deeply rooted business in the canoe world is Twin River Outfitters in Buchanan, Va. Services run the gamut from tube, kayak, and canoe rental to full service guided overnight trips on a variety of river sections. The French Broad provides a perfect foundation for a canoe trip as it flows out of the dramatic peaks near Brevard, N.C. This river provides consistent class I for nearly 80 miles in its trip to Asheville, and it is now possible to break the long journey up with a series of new campsites from the Western North Carolina Alliance. Rent a kayak or canoe from Asheville Adventure Rentals, located right next to the river and near a convenient takeout at The Bywater. The Linville Gorge embodies “wild” better than any other waterway east of the Mississippi. This river begins its journey on the slopes of Peak Mountain and Sugar Mountain, and winds its way inconspicuously through the high country until Linville Falls. It is there that the river drops off the face of the earth, and does not slow down until 17 miles and 2,000 vertical feet later, when it empties into Lake James. This gorge is referred to as the “Grand Canyon of North Carolina,” and draws diehard paddlers, hikers, and climbers from around the region to test their mettle and witness the spectacular scenery that the river gives up around every corner. Highlights include the Babel Tower, Table Rock, Sitting Bear, and Hawks Bill promontories. The gorge is in fact so rugged that many areas of it were never logged, and are still covered with old growth forest. The Linville has cut its way into the billion-year-old core of the Blue Ridge, and at points sheer walls rise straight out of the river. This is a dream for deep-water solo climbers, and only enhances the expedition feeling of kayaking the river. For paddlers, the same granitic gneiss that has allowed for the dramatic gorge to be carved is also a serious hazard, with many hidden sieves and undercuts. The most popular section from Babel Tower to Conley Cove requires top-notch class V water reading and paddling skills, but as long as the right lines are taken, the whitewater is nothing short of brilliant. This river is also an excellent overnighter, starting at Linville Falls, camping at Babel Tower, and continuing down to the lake the next day. Check out the powerful and beautiful Linville Falls. A number of vantage points are available via a hike from the parking area, and watching the entire river drop into that massive chasm is nothing short of mesmerizing. The Obed River is a spectacular National Wild and Scenic River, and it carries limitless potential for paddlers, hikers, and climbers. The beautiful whitewater on the main river and its tributaries is accessible to Knoxville, Chattanooga, and Nashville enthusiasts. In spite of the excellent rivers and athletic destinations in this guide, some of us are still looking for a more laid-back experience. The idea of getting away from the grind is, after all, to relax, right? The Shenandoah River is a perfect place for swimming, tubing, or even just unwinding in the sun. One of the subjects of the John Denver song, “Country Roads,” this river lives up to that reputation. Most of the tubing and swimming activities are centralized in the two towns of Luray, Va, and Harper’s Ferry, W.Va. These towns can both be quickly accessed from many of the surrounding cities, and they are perfect destinations for a quiet float or swim. 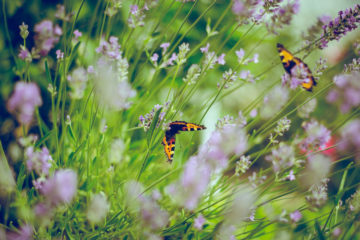 While you’re there, keep your eyes peeled for the native blue herons, Canada geese, and even an occasional bald eagle. Prime season tends to run from Memorial Day to the end of August, and various sections of the river can be leveraged as water levels fluctuate throughout the season. Bring your rod for smallmouth bass fishing on the river as well. One of the hubs for Shenandoah tubing and swimming is certainly Harpers Ferry, which is located at the confluence of the Shenandoah and Potomac Rivers. A unique and enjoyable attraction of the town is Harpers Ferry National Historic Park, where visitors can learn about John Brown’s Raid and the area’s impact on 19th century industry. The Davidson River near Brevard, N.C., is the ideal river for cooling off on a lazy summer day. As it flows through Pisgah National Forest, the river provides the perfect place to kick back and float in a tube, or hang out with friends. After your float trip, check out Looking Glass Falls and Sliding Rock just up the road. For avid East Coast anglers, the Rose River in Virginia represents an experience not to be missed. This river flows through Shenandoah National Park, and offers up quality-sized wild brook trout and brown trout and large, stocked rainbow trout. 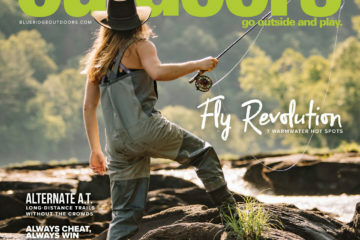 The fishing is excellent, and the river is conveniently situated seven miles from Madison, Va., 25 miles from Charlottesville, and less than a two-hour drive from Washington, D.C. The Rose winds its way through Shenandoah National Park before flowing into the valley, and the scenery is stunning with views of Old Rag Mountain, Double Top, and others. The river itself is crystal clear with very little sediment, and is loaded with invertebrates, bugs, crayfish and minnows, all of which make excellent food for the trout. It rarely freezes in the winter, and stays cool all summer. Catch-and-release regulations are strictly enforced along its entire length, and sections of the stream have been compared to the Provo River near Salt Lake City, Utah, and other small streams in Montana. Anglers can enjoy the waters within the park, or can opt for a more private experience downstream at the Rose River Farm. This 1.5 mile section of river is enforced as fly angling only, and serves as a philanthropic hub for organizations such as Project Healing Waters and Casting for Recovery. If possible, schedule your angling trip around a monthly Night Skies Program in Shenandoah National Park. This is an outdoor tour through our night sky with astronomers at Big Meadows. Bring a blanket and a lawn chair, and learn more about celestial dynamics through the lenses of various telescopes. 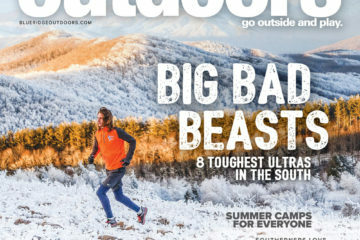 *Southern Superlatives: A list of the best hikes, scrambles, trails, and more in the South!